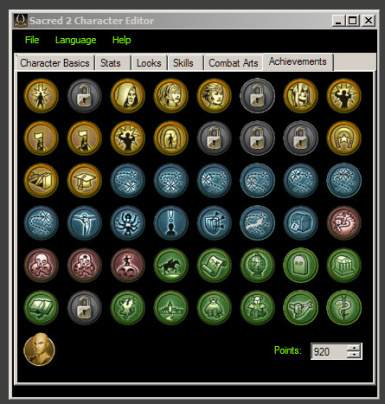 Sacred 2 Character Editor allows you to edit your attributes, skills, combat arts, gold, XP, name, appearance, and almost any other aspect of your character. Russian guys - Creating s2sdec.exe - the decoder for Sacred 2 saves. DescentJS - Creating the initial version of the editor. ase69_s - Making his valuable changes. MT4K - Finding the missing Shadow Warrior Combat Art. VirusSX - Finding an OutOfRangeException on the CA tab (and even documenting a fix for it). gasper- Providing saves that allowed me to discover and fix some critical bugs. - Providing chest file that allowed me to find the Dragon Mage achievement. - Finding an OutOfRangeException on the level up button. acidoangel - Finding a max value bug on the CA level box. jimbouk - Providing saves that allowed me to discover and fix NullReferenceException bug during save. - Finding and providing source for the s2sdec.exe program, thus allowing me to fix it to decode and repack chest files. - Finding a hex value in the chest file, that allows to unlock game movies. - Writing down possible game version values in a save file. Funest- Finding and documenting a NullReferenceException bug during save. TinGoose - Providing a specially prepared Dragon Mage savegame that allowed me to find Dragon Mage class skills. amrastin - Providing a chest file that allowed me to discover and fix some achievement bugs. lngc16506- Finding mixed High Elf CA descriptions. 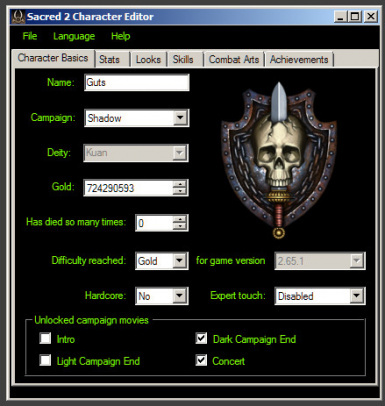 redgbreaker - Providing Sacred 2 skill, CA and stat icons in one compressed archive, so that I didn't have to search for them all over the web. - Translating the editor to French. 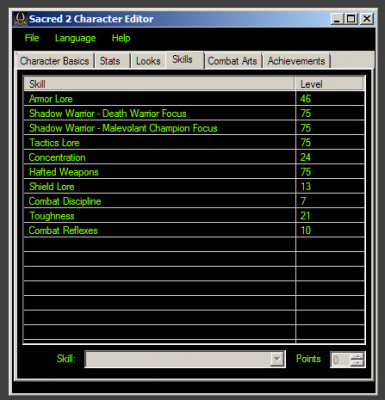 unknowngst- Posting a guide (at darkmatters.org) on how to edit character looks in the savefile. aerion0p - Finding a hair color bug. k8d0s - Providing a save file that allowed me to find and fix the incorrect starter byte bug. 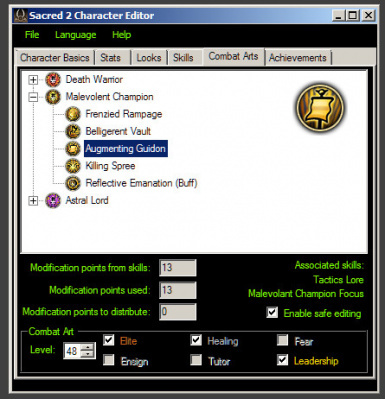 -FTR-- Posting a guide (at darkmatters.org) on how to edit Expert Touch in the savefile. Treufeldt- Providing a a save file, that allowed me to find and fix the "Experience not found" bug. 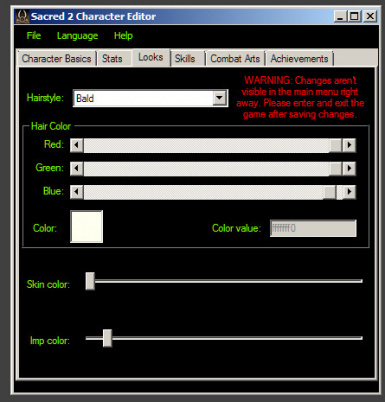 This tool is meant to be used with Sacred 2 + Ice & Blood expansion, or any version of Sacred 2 Gold. It will work with or without the Community Patch installed. English, French, and Polish languages are supported. 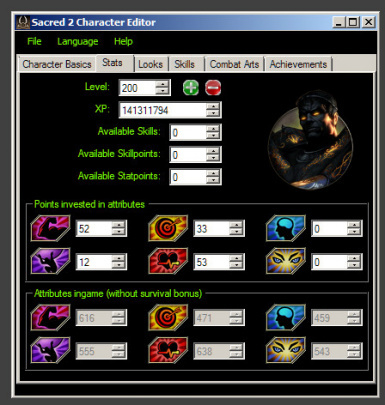 Run Sacred2CharacterEditor.exe and select a hero save to edit.